A member of the Junior Bison Basketball Club has made a generous donation to the SWISH Basketball program. 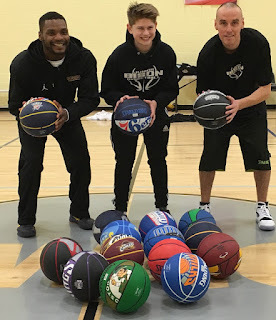 Dylan Kagan, a Gray Academy grade 8 student, decided to make a generous donation to Winnipeg based program SWISH that offers a free drop-in Basketball center every summer downtown. SWISH Program Coordinator Xavier Smith was thrilled to receive the first batch of balls that Dylan collected as an act of Kindness as he turned 13 last month. This young sports fanatic thought "it is the right thing to do, help those who are not as lucky as i am". Dylan will also volunteer his time among SWISH youngsters this summer under the guidance of Coach Xavier Smith. Thanks to Dylan for helping the community and support the game of Basketball.